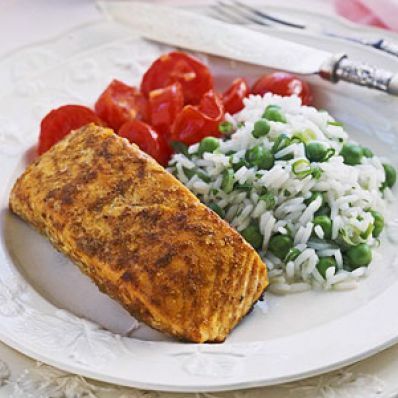 Nutty tasting basmati rice stars in the pilaf and complements the spice-rubbed salmon. The refreshing cucumber and yogurt raita tames the Indian spices. 1 of 1 In a small bowl, stir together the chopped garlic, chopped fresh ginger, curry powder, lemon juice, paprika, salt, cinnamon and cayenne to make the spice rub. Place the salmon fillet, skin side down, in a glass baking dish. Spread the spice rub over the top of the salmon. Cover; refrigerate for 30 minutes to marinate the salmon with the spice rub. 1 of 2 In a small bowl, stir together the yogurt, sliced cucumber, lemon juice and salt. Cover the bowl; refrigerate for at least 30 minutes or up to a day ahead. 2 of 2 After the salmon has marinated in the refrigerator for 30 minutes, heat the oven to 450 degrees F.
1 of 4 In a medium-size saucepan, combine chicken broth, salt, black pepper and rice. Bring to a boil. Lower heat; tightly cover the saucepan and gently simmer the rice for 10 minutes. 2 of 4 Stir the chopped garlic and chopped scallions into the rice mixture; cover the saucepan and simmer for 5 minutes. Gently stir in the thawed peas; cover and simmer until the peas are heated through, the rice is tender and all the liquid is absorbed, 3 to 5 minutes. 3 of 4 While the rice is cooking, bake the salmon in 450 degree F oven until cooked through, 12 to 15 minutes. Stir in parsley into rice. 4 of 4 Serve salmon with raita and basmati rice pilaf on the side. 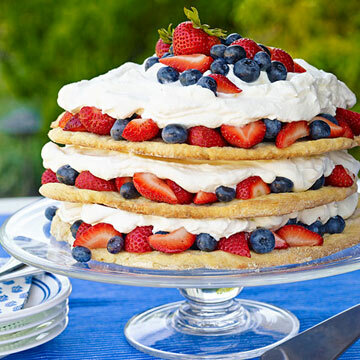 Makes 6 servings.